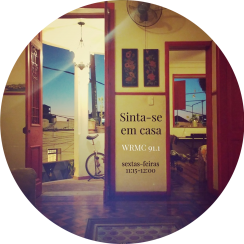 “Sinta-se em casa” means “make yourself at home” in Portuguese. That’s what we’re asking of our guests and our listeners. If you speak some Portuguese, ótimo! That’s a show that even basic speakers will be able to enjoy. If you don’t speak any Portuguese, não se preocupe, só curta uma boa música (don’t worry, just enjoy good music).